On U.S. Highway 183, one mile north of Mountain Park, Kiowa County. CAMP RADZIMINSKI. In September 1858, Bvt. Maj. Earl Van Dorn led soldiers of the Second U.S. Cavalry and First Infantry from Fort Belknap, Texas, in pursuit of Kiowa and Comanche raiders. 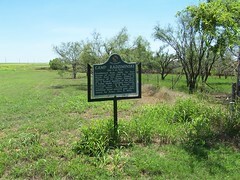 Reaching the vicinity of present Tipton, in Tillman County, Oklahoma, Van Dorn ordered the construction of a camp on the left bank of Otter Creek. 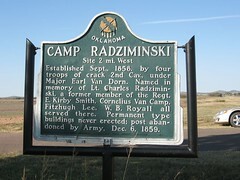 Named in honor of First Lt. Charles Radziminski of the Second U.S. Cavalry, the post contained no permanent structures. Also known as Camp Otter Creek, and Otter Creek Station, it was moved in November 1858 to better forage a few miles up Otter Creek. In March 1859 the camp was relocated a final time to a more sheltered site on the right bank of Otter Creek, four miles northwest of present Mountain Park, in Kiowa County. From his base of operations at Camp Radziminski Van Dorn led his troops against the Comanches at the Battle of the Wichita Village near present Rush Springs, Oklahoma, in October 1858, and at Crooked Creek in southwestern Kansas in May 1859. Abandoned after the completion of Fort Cobb in December 1859, Camp Radziminski was briefly used by the Texas Rangers in their warfare against the Comanches. 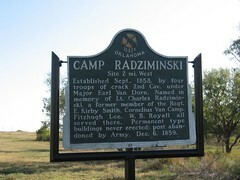 The site of Camp Radziminski near Mountain Park was placed on the National Register of Historic Places in 1972 (NR 72001067). information is from the book, Mark of Heritage, by Muriel H. Wright, courtesy of Oklahoma Historical Society. 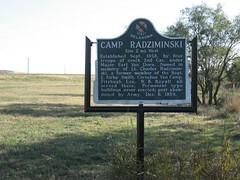 * A big thank you to Jeff from Omaha, NE for e-mailing in this picture of the Camp Radziminski marker. 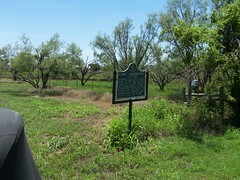 Marker was not missing, the highway had been under construction and the road signs that read historical marker ahead had been removed and were replaced when construction was finished.